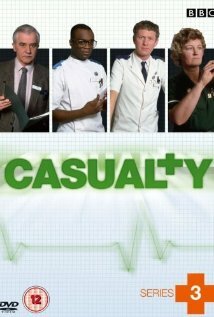 Drama depicting the private and working lives of the patients, doctors, nurses and others attending a small but frantically busy accident and emergency department of the large Holby General hospital. 29 November 1991 - Season 6, Episode 12: Pressure! What Pressure? 03 October 1992 - Season 7, Episode 4: Will You Still Love Me? 14 December 1996 - Season 11, Episode 14: Do You Believe In Fairies? 14 August 2004 - Season 18, Episode 44: Who Cares? 17 December 2005 - Season 20, Episode 16: Do They Know It's Christmas? 26 January 2008 - Season 22, Episode 23: Where's the Art in Heartache? 14 June 2008 - Season 22, Episode 41: Is She Really Going Out With Him? 28 February 2009 - Season 23, Episode 27: Could We Be Heroes? 30 May 2009 - Season 23, Episode 39: Who Do You Think You Are? 03 March 2012 - Season 26, Episode 25: Ricochet "How to Save a Life"
10 March 2012 - Season 26, Episode 26: Ricochet "Damage Control"
17 March 2012 - Season 26, Episode 27: Ricochet "What Goes Around Comes Around"
11 December 2010 - Season 25, Episode 15: What Lies Beneath? 15 August 2015 - Season 29, Episode 44: Knock Knock Who's There?